Contemporary artist, Yoshinari Nishio, unfolds the projects which refer to the relationship between fashion and communication with the cooperation of local residents, students and his family. 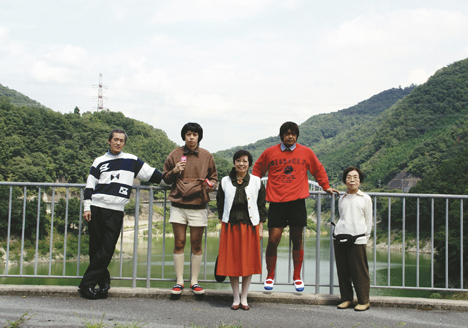 He was born in Nara in 1982 and obtained a D.F.A from Tokyo University of the Arts (Department of the Inter Media Art). Since 2007, he had been going to Africa several times and working in both Tokyo and Africa. He received a grant from the Japanese Agency for Cultural Affairs and started to live in Nairobi for two years from September 2011. 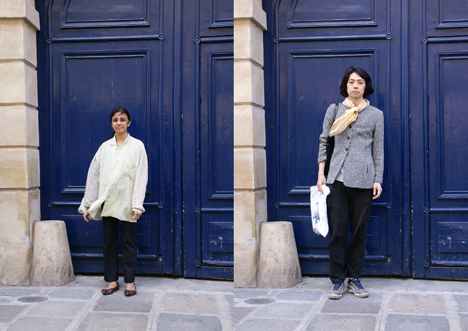 His representative projects include “Self Select” in which he exchanges clothes with pedestrians in various cities across the world, “Family Uniform” in which he reproduces his old family photographs with same clothes at the same location, “Overall” in which he reconstructs lost objects around the world with patchworks created from second-hand clothes, and “Studio for Forming on Words” in which children create different forms by imaging out of different words. There is always a fashion as a basis in Nishio’s projects. A boy who used to like modern fashion, got out of a consumer society and started to seek an expression without being captured by an outline of regulations. It was his beginning for artistic expression. A criticism against consumer society always stays inside the artist, who started to look at the society with his unique eyes. However, Nishio does not show the direct repellence. He expresses himself on his own way at the place he found. Your production style is usually open for public and requires the participation of viewers. How did you establish this style? My first project was a workshop. When I was a student preparing for an university examination, I made 35 clothes which can be used as a ticket to my workshop and their parts can be separated. The participants picked their favorite among the clothes I made and communicated with other participants to exchange the parts of their clothes. While they were exchanging the parts, the appearance of their clothes transformed into something new. It was my first artwork which I created consciously. At this point, I’ve already had an idea of the participation style. Fashion and participation style are connected inevitably in my theory. How to express the connection as a form is developing in various ways; for example, exchanging clothes and making patchworks etc. For my first project, I had all participants gathered in a workshop space. The space became surrealistic in a way and I felt that something was wrong. Therefore, I started to develop the projects with the cooperation of family and pedestrians to intervene in a reality. When did you start your activity in Africa? The reason I went to Africa is very personal. My wife studied region studies at the university and chose Kenya for her research. 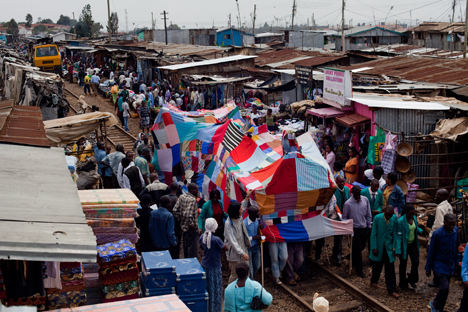 In 2007, I went to Africa first time to accompany my wife and traveled around Kenya including Nairobi. This travel made me think to connect my project with my experience in Africa. I availed myself of an opportunity when my wife went to Africa again in 2009 and did “Self Select” which I could do without any tools or materials. To carry out this project, I got a help from my wife and her local friends. At this time, I did not have any aid and it was just a part of my travel. When you accomplished “Self Select”, did anything flash into your mind to do something more in Africa? Yes, indeed. I cannot describe the feeling well but I feel comfortable and energetic when I am in Africa. There are several reasons why I feel this way. In Africa, I do not need to worry about the artistic evaluation. Also I can feel that communicating with people is real and see the energy potential that you can do anything if you act there. I did not choose Africa for conceptual reasons but it just started naturally with my personal reasons. In addition, I’ve always had a criticism against the Western leading art. This must be one of reasons why I produce art in Africa. But I am not planning to impact the art society from Africa. It is more persuasive if I put it into practice than arguing about my criticism. Word will follow the action. You also did “Self Select” in France. What is the difference between France and Africa? The most distinctive difference was that African people stopped and listened my explanation. In France and Japan, most people refused as soon as I talked to them. On the contrary, people in Kenya listened to me with interest. I feel that they have more curiosity and time to spare. The children, who participated in my workshop at a Japanese nursery, had similar energy with the Nairobians. They are curious and interested to participate if something is going on. The project of making a steam locomotive with patchworks was not announced beforehand. However it spread by word of mouth and the number of participants increased gradually. Then we ended up walking on a railroad for an hour. African people are active and find joy by themselves. It is unusual in Japan. When I create patchworks, I always have a rule to use only existing materials at the location. If I use new materials, it will change the communication. I just change how to use them to give a variety in communications. Also, I have decided not to design any clothes. So you are not particular about the design or materials? No, I ignore them. If I was a person who care about design and material, I would never done these projects. What I am looking for is a different value of fashion without design and materials. Patchwork is the way to break all stereotypes about art and fashion by cutting fabrics into pieces. Although you stick to the idea of communication, is there a reason why you do not include the words of African people during your project? I encourage the communication by the conduct, not by the words. It is not important for me that I have a conversation with a pedestrian after we exchange our clothes. The act of exchanging clothes matters to me. I guess that I am still looking for a style of various communications and I am achieving my goal by trying them out. When I watched the video of making a steam locomotive for “Overall” project, I got an impression that African participants were really enjoying the project. Lots of African people love watching soccer and dancing at night clubs. People hold simple things in common such as songs, dance, liquor and soccer. I am not good at communicating with them in their ways, therefore I’m creating my own communication tools such as exchanging clothes and making patchworks. They seems to be amused when they are participating in my projects. The pleasure is a bit different from the joy when they dance. People seems like they are searching for something new and it will connect to something different. Why do you let all sorts of people including your family and pedestrians get involved in your work? Because I want all sorts of people to look at my work and ideas. I noticed that there are some people who I can not convey my idea through the classic form of art. Therefore I came up an idea to involve these people, who tend to keep a distance from art. My interest in fashion became a hint too. In the first place, everybody has an experience to wear clothes. I am exploring different experiences of wearing clothes by exchanging clothes and doing performances. Do you mean your participants are your audience? That’s right. My best audience are the participants. I use photography and video to show it to non-participant audience. But it is not important for me. Taking photographs, videos and producing clothes are intervened by techniques of production. I understand that this process is important to convey the information to the others but it is not essential. The participants who get involved primarily is the most important. You chose Africa to be your base for two years from 2011. Is it easier to work in a foreign country than in Japan? Not really. I am still not sure how the things go in a foreign country so I cannot compare them yet. However, I started to become a regular guest artist for some art projects and feel like I am a controlled piece. I rather choose where and what I do by myself than doing assignments in an assigned place. Do you have a feeling of wrongness to fit in the regimented model of art society? Yes. I feel like I am consumed sometimes. It is a bit unbearable when I have to do something at the place where I was invited for a large scale art project. Then I am invited again from another place and have to move as soon as I finish. It is a problem that I have to go around in a hurry. You turn clothes into a motif. Is fashion still an important element for your work? Yes, I always go back to the main idea. I consider how far I can separate it from the form of clothes. It is important for me not to detach from clothes but create something by centering the main idea on clothes. Now that things have come to this point, I would like to say that all my projects are fashion design itself in this time. What is your plan in Africa? I don’t have a detail yet but I would like to keep sticking to fashion and get connected to African fashion brands. I want to take my project to somewhere stable. It can be a way of communication if my experimental project enters in the social system, including economics. It should be easier to enter the system because I use clothes for my project. Fair trade is one of the ways but I want to find something in my own way. How do you announce your new work? 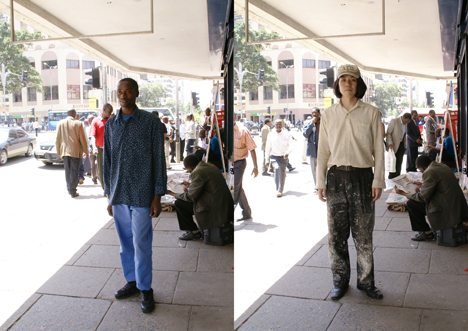 I want to use blogs and Skype to introduce my new work to Japan from Nairobi. I also want to create something like a magazine. It will be a free paper which features articles based on the themes of my work and be prepared and edited in Africa. It will be a tool to broaden the words. From which artists you got inspired from? I do not have anybody who I got influenced on directly. But I was encouraged by Katsuhiko Hibino and Tadashi Kawamata who were my professors at the university. Their ideas, work and lives make me think that I can do whatever I want. I also like Boltanski and many more which I can not list them up all. You experienced to work overseas. Please give a message to artists who work in Japan. Please come to Africa once. Anybody can have an interesting experience by finding out what you can do in Africa. If you come to Africa to create art, it will give you a great opportunity to look into yourself again. The things you have done in Japan might be accepted in different way or not. I especially want young generations to see these different ways of possibilities. Now that people understand that not only stereotyped art is art, they will broaden their choices and make the arts and society more interesting. When we first go to a foreign country, we tend to overwhelm. But nothing will happen if you don’t act. This will connect to the next step.